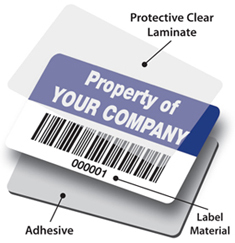 Need a high-performance ID asset label solution for extreme situations? Aluminium foil labels are a highly durable premium label material suitable for identification and asset labels for both indoor and outdoor use. Dantech uses a 0.05mm aluminium foil with the best available 3M hi-tenacity powerful adhesive which will adhere to most surfaces and bond to both high surface energy (HSE) and low surface energy (LSE) plastics, powder coatings and slightly oily metal surfaces. A clear laminating foil is applied on top of the printing to help protect the printed image against abrasion and solvents and provide heavy-duty protection. Dantech aluminium foil labels have a very high-temperature resistance, up to 150° C short term, and down to - 40° C and can only be described as a universal solution to suit most asset label requirements. Our aluminium foil label material and its adhesive have a highly rated chemical resistance and tested with many common chemicals, water and oil. Labels must be applied to a clean, dry surface – full instructions are included with your order.